SportMaster ColorPlus System is revolutionizing the tennis court surfacing industry. SportMaster Color Concentrate is a 100% acrylic emulsion coating designed for tennis courts and other sport and recreational pavement surfaces. More information can be found on the SportMaster website. This permeable system is installed in a single (1) phase, by mechanical paver. A unique blend of single component polyurethane binder and black SBR rubber granules. TopTrax 4000 Series (SBR/Black) is the most economical polyurethane surface available making it an excellent choice for schools and municipalities seeking the advantages of polyurethane on a limited budget. This permeable system is installed in two (2) phases. It starts with a mechanically paved base mat consisting of a unique blend of single component polyurethane binder and black SBR rubber granules. The second phase involves the addition of multiple “structural spray layers” consisting of pigmented polyurethane binder and colored EPDM rubber granules. This adds color, texture and increased protection for the base mat. The Toptrax 5000 Series is the most economical colored polyurethane surface available. This impermeable system is installed in three (3) phases starting with a mechanically paved base mat consisting of a unique blend of single component polyurethane binder and black SBR rubber granules. 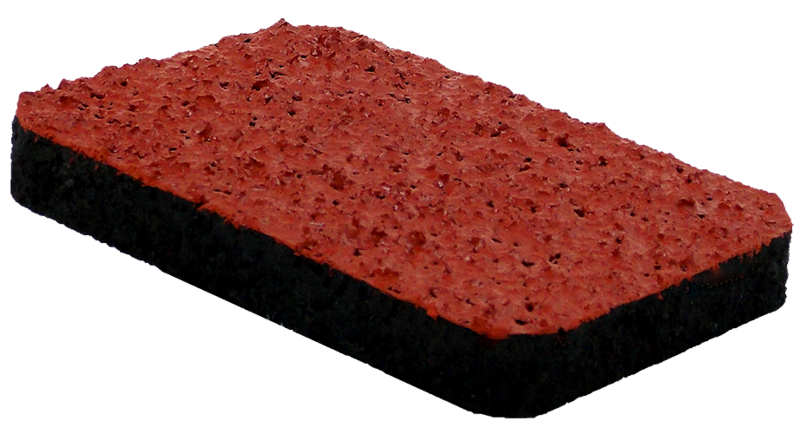 The porous base mat is then rendered non-porous with a squeegee applied two-component, colored polyurethane sealer. In the final phase a substantial wearing course is applied consisting of a massive liquid layer of 2-component, colored polyurethane into which colored EPDM rubber granules are broadcast to create a plush, “embedded” surface texture. TopTrax 6000 Series exceeds performance characteristics and longevity projections offered by other polyurethane systems. This impermeable system is installed in three (3) phases starting with a mechanically paved base mat consisting of a unique blend of single component polyurethane binder and black SBR rubber granules. The porous base mat is then rendered non-porous with a squeegee applied two-component, pigmented polyurethane sealer. In the final phase color, texture and additional protection are added by introducing a combination of pigmented polyurethane binder and colored EPDM rubber granules which are “structurally sprayed” onto the surface of the sealed base mat to create the finished surface. Increased longevity and enhanced performance are characteristic of our TopTrax 7000 Series system is making it popular at University, High School and Municipal levels. Authorized installer of the Stobitan Surfaces manufactured by Stockmeier Urethanes. Please read this Stobitan brochure for full product details. Entry level permeable track system. Permeable and Spike Resistant. A finely granulated finish, providing a soft comfortable surface. IAAF certified. Impermeable and Spike Resistant. A finely granulated finish, providing a soft comfortable surface. IAAF certified. Sandwich Design, Impermeable, and Spike Resistant. Flexible athletic running track system. IAAF certified. Compact, Impermeable, and Spike Resistant. Durable system for high performance sports. IAAF certified. This permeable system is latex based and is installed in multiple layers. The system utilizes SBR rubber granules ranging in 1 to 7 MM gradation. Each layer of rubber granules is coated with SBR binder. 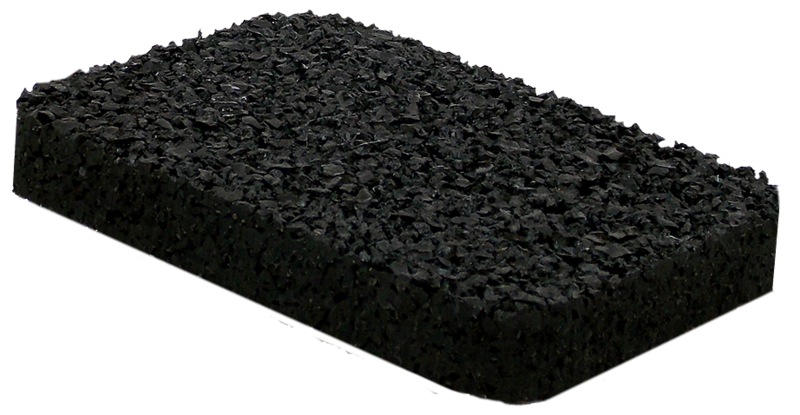 On the final layer, we use a mixture of rubber granules and stranded rubber for extra strength. Thickness Options - 3/8", 1/2"
This permeable system is latex based and is installed in multiple layers. The system utilizes SBR rubber strands, coarse and medium grades are used. Each layer of rubber strands is coated with SBR binder. This permeable system is latex based and is installed in multiple layers. The system utilizes SBR rubber granules and rubber strands. The base layers are rubber granules and the top layers are stranded. Each layer of rubber is coated with SBR binder. This permeable system is latex based and is installed in multiple layers. The system utilizes SBR rubber granules for the base layers and EPDM rubber granules for the top layers. The EPDM rubber granules are used to achieve the desired color of the surface; this is a sandwich system. Each layer of rubber is coated with SBR binder. This permeable system has latex base and a polyurethane wearing course. 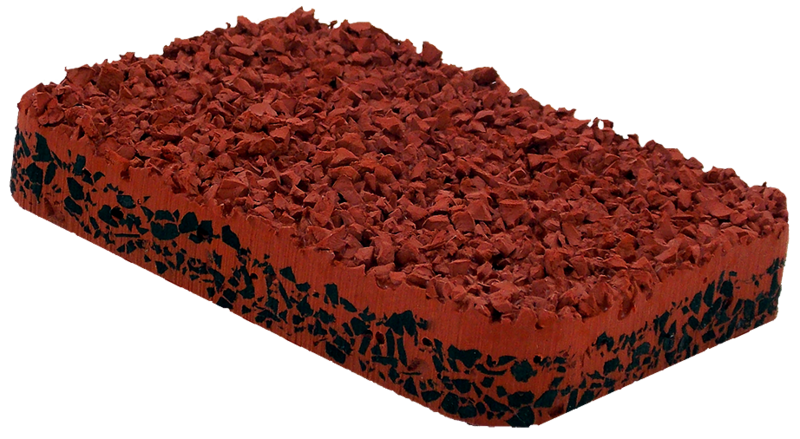 The latex base is installed in multiple layers of SBR rubber granules. Each layer is coated with SBR binder. After the desired thickness has been achieved, two coats of a colored polyurethane structural is applied. The polyurethane structural spray is mixed thoroughly with EPDM rubber granules and is sprayed applied. SportMaster running track systems are designed for application over properly prepared asphalt, concrete or latex-based running track surfaces. TrackMaster systems contain small rubber granules that enhance the flexibility of the coating and add to the overall shock absorption of the surface. Our synthetic running track formulations beautify and protect against oxidation, raveling, and moisture penetration. TrackMaster Plus is available in all SportMaster standard colors by utilizing ColorPlus Pigment Dispersion. ColorPlus contains high quality pigments to ensure vibrant color, hiding, and many years of non-fading performance. Resurfacing existing SBR latex running tracks. 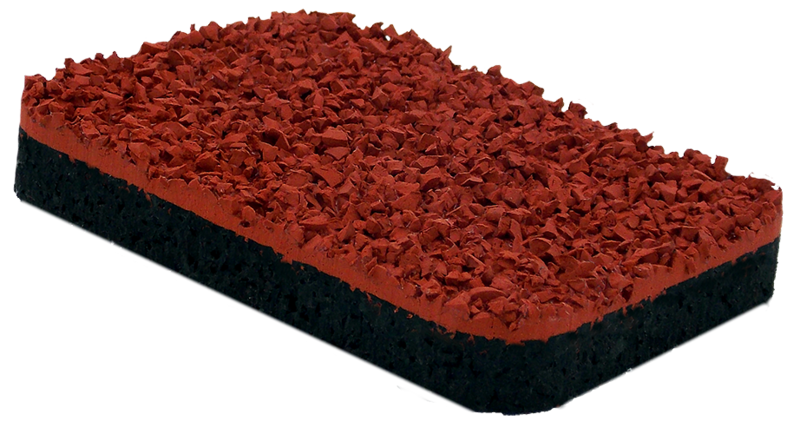 Use as an athletic track surface on new or existing surface (asphalt or concrete). Walking path, jogging trails, middle and high school track. Coating for rubberized asphalt track. This system involves the addition of multiple “structural spray layers” consisting of pigmented polyurethane binder and colored EPDM rubber granules. This adds color, texture and increased protection for the base mat. This system contains a new wearing course. 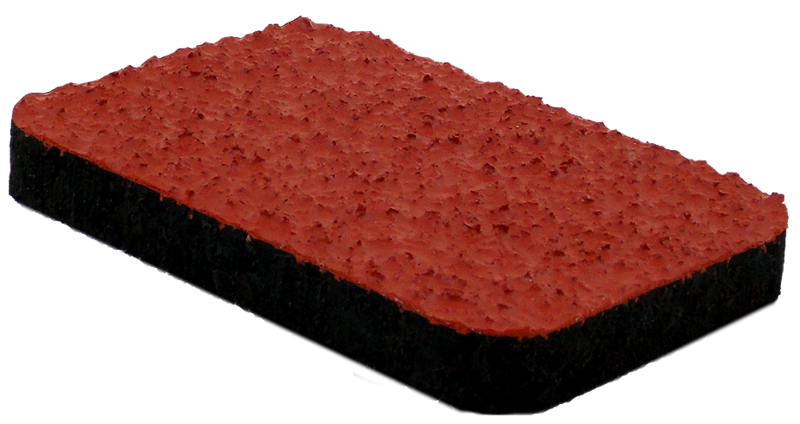 This application consists of a massive liquid layer of 2-component, colored polyurethane into which colored EPDM rubber granules are broadcast to create a plush, “embedded” surface texture. This permeable system is latex based and is installed in two layers. The system utilizes a mixture of SBR rubber granules and stranded rubber. Each layer is coated with SBR binder. This permeable system is latex based and is installed in two layers. The system utilizes medium sized SBR rubber strands. Each layer is coated with SBR binder. This application consists of one coat of highly pigmented SBR binder. This should be applied to latex surface after its first five years. All striping, or lining, will be done in coordination with school personnel to ensure a custom application of the line and event markings suitable to the needs of your program. All American Tracks can also add custom colors, logos, and artwork to the event area. The precision of the work involved will not only satisfy the athletes who compete on the track, but it will also provide a visually superior display for the spectators. Track lining and event marking are very complex projects. They should only be done by highly specialized, skilled and qualified personnel. All American Tracks Corporation is a member of the U.S. Tennis Court and Track Builders Association. All American Tracks conducts certification in accordance with NFSHSA, NCAA, or IAAF standards. You can be assured that your striping and restriping projects are being handled by qualified, experienced professionals when you choose All American Tracks. A well-designed, well-constructed and well-maintained track will offer years of service. To maximize the useful life of the track regardless of the type of surface, All American Tracks has developed a regular schedule of maintenance. Despite the fact that it results in a more regular outlay of funds, a regular inspection of the track and repair of minor irregularities is more cost-effective than allowing the track to deteriorate to the point where it requires major repair or reconstruction, or to the point where it has become dangerous or even unusable. Note, however, that even with regular maintenance, over time, every track – even the best ones - will need some repair and, eventually, every track will need to be replaced. All American Tracks proposes to maintain the rubberized track surface at insert owner for a period of five (5) years. This program has been developed so your rubberized surface will be inspected and maintained on an annual basis. This programs also helps the owner budget their money, instead of receiving a large bill, this breaks out the cost over five years. Each year All American Tracks will inspect the surface, provide a detailed report to the owner on the condition and the worked preformed. The maintenance program is not a warranty. It is intended to make minor repairs, to keep the surface safe for the athletes. In the first four years we will repair areas such as; gouges, delaminated areas, cracks. In the fifth year we will repair the high use areas that have become worn, if necessary. In the fifth and final year of the contract, we will clean the existing surface of dirt and loose debris, using high powered blowers. Make the necessary repairs as described above. Apply a coat of highly pigmented SBR binder or polyurethane structure spray (depending on type of surface) to the track and field event areas. Repaint all lane lines and event markings as they currently exist. Year 1 – inspect the surface, provide owner detailed report, make repairs. Year 2 – inspect the surface, provide owner detailed report, make repairs. Year 3 – inspect the surface, provide owner detailed report, make repairs. Year 4 – inspect the surface, provide owner detailed report, make repairs. Year 5 – inspect the surface, provide owner detailed report, make repairs, clean, apply highly pigmented SBR binder and repaint lines and event markings. A mineral filled asphalt emulsion pavement sealer designed for sealcoating, protecting and beautifying all types of asphalt and blacktop driveways, parking lots and more. A regular scheduled sealcoating program utilizing MasterSeal will more than double the life of your asphalt and blacktop. 2016 All American Tracks, Inc.